A standard yet delicious stir fry. My family prefers this one to all the others. Dusting the chicken with flour keeps the moisture in. You can always substitute steak, pork, or firm tofu. Be sure not to overcook your vegetables or meat. Serve over rice or rice noodles. 1. To make the sauce: In a small bowl, whisk together stock, soy sauce, hoisin sauce, cornstarch, sugar, sesame oil, garlic, and ginger. 2. Dust chicken with flour. In a nonstick wok or frying pan sprayed with vegetable spray, cook chicken for 3 minutes, or until browned on all sides but not cooked through. Remove from pan. 3. Prepare noodles according to the package. 4. Respray pan; add oil and sauté red peppers, snow peas, and garlic, stirring, for 2 minutes, or until vegetables are tender-crisp. Stir sauce; add to wok along with chicken and cook for 2 minutes, or until chicken is cooked through and the sauce has thickened. 5. 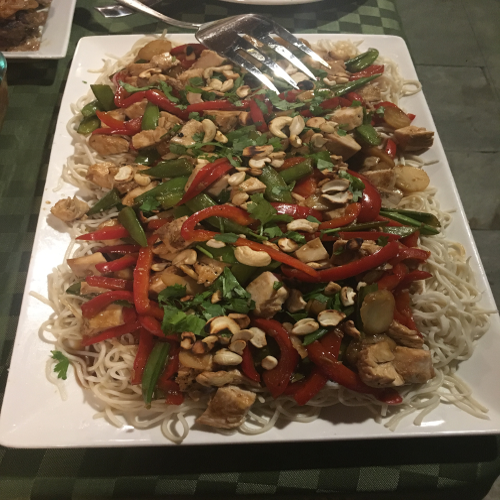 Pour chicken stir fry over noodles. Garnish with cashews and green onion.